After a long delay (four years to be exact), we finally have begun to update our family room decor. New couch- check! 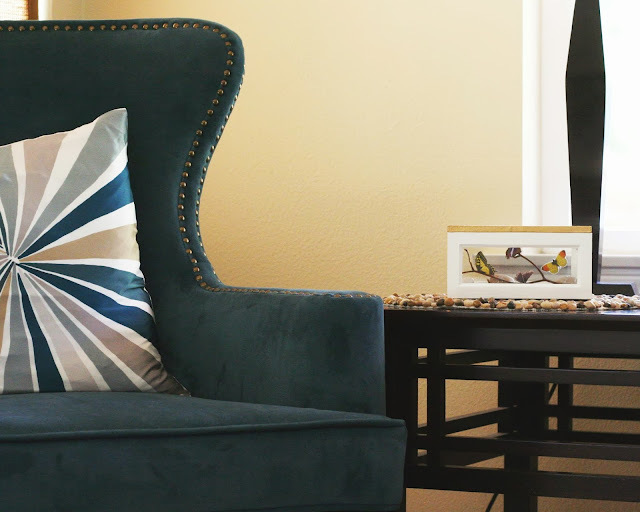 Accent chair- check! Coffee table- check! Rug and throw pillows- check! We just need a couple more pieces to finish it off and make it share-worthy. While I like our new furniture, there's a lot of grey and dark wood and it was starting to look a little too masculine and serious. No-can-do. I need whimsy! I need fun! 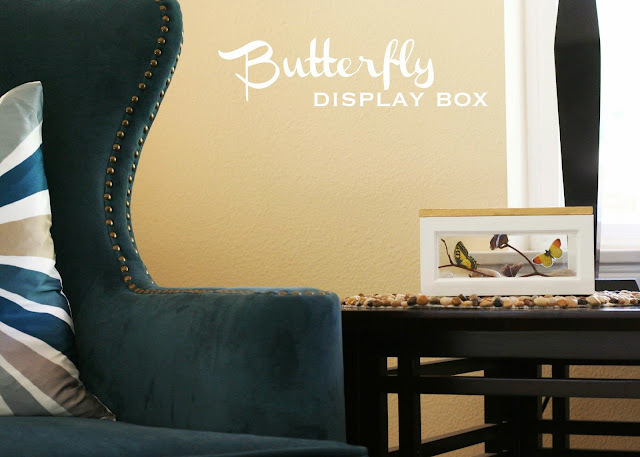 Enter the teal chair, bull's-eye pillow and this butterfly display box. 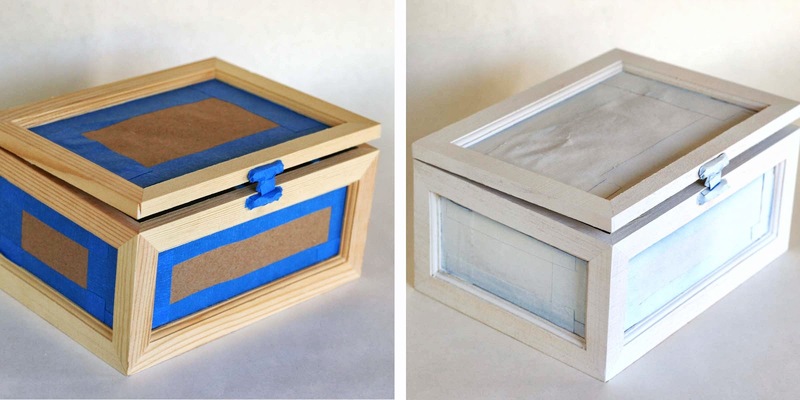 Sand the unfinished wood on your display box and then tape off the glass panels with painter's tape. Remember to cover both the panels on the inside and outside of the box. For quicker coverage, spray the box with a coat of primer. [Optional] After priming the box, I decided to remove the latch on the box for a cleaner look. If you decide to remove the latch, do so after priming since it helps keep the lid ajar while drying. I later removed the latch and filled the holes with wood putty. Finish painting the box with a final coat of acrylic paint. Let dry completely. Mix your decoupage medium by rolling the bottle on a flat surface. I coated the entire inside of the box with decoupage medium. With its water-proof qualities, the decoupage medium will protect the wood from any water and condensation inside the box. Since I plan on using the box to house some mini-plants, this is an important step. Now it's time to decorate your box. 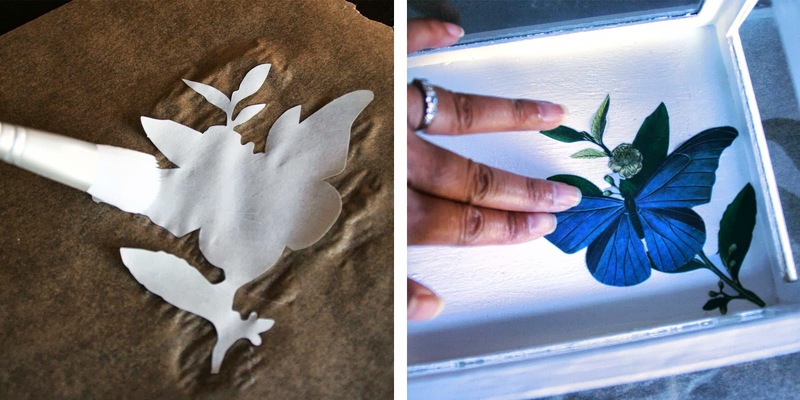 While your base coat is still tacky, lightly paint on a thin coat of decoupage medium onto the back of your chosen decorative paper. Gently, but firmly press down the paper onto the surface of the box. Smooth edges and remove any air bubbles. Finish with a final top coat of decoupage medium to seal and protect your work. First, clean the surface of the glass with rubbing alcohol. Let dry completely. 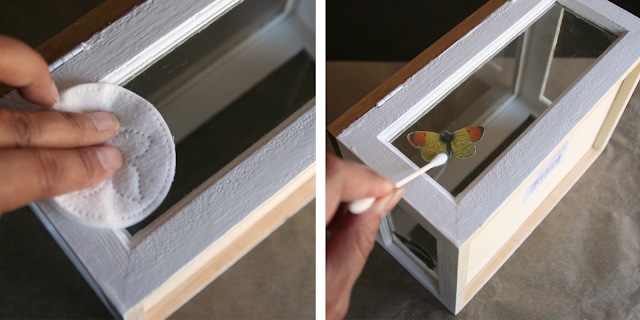 Then apply a thin layer of decoupage medium on the glass in the spot where you want to adhere your butterfly. 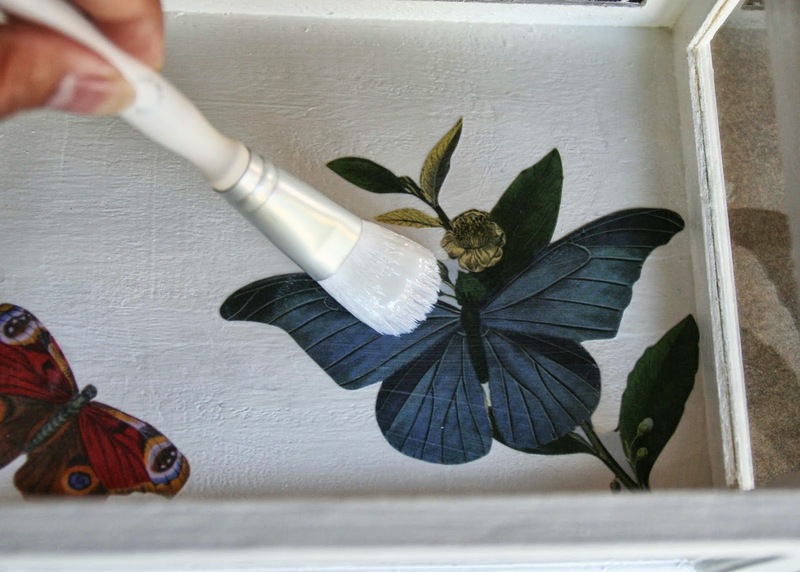 Brush on a thin coat of decoupage medium onto the back of your paper butterfly and gently, but firmly press it onto the glass. Apply the final coat of decoupage medium on top of the paper butterfly. This will seal and protect the decorative paper. 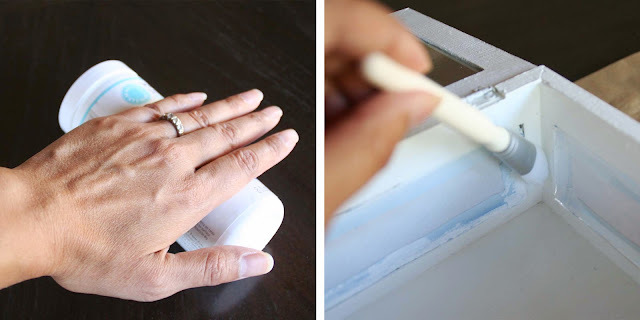 Before the decoupage medium dries, take a cotton swab and remove any excess medium from the glass. If you need to, dampen the cotton swab with a little water or rubbing alcohol. 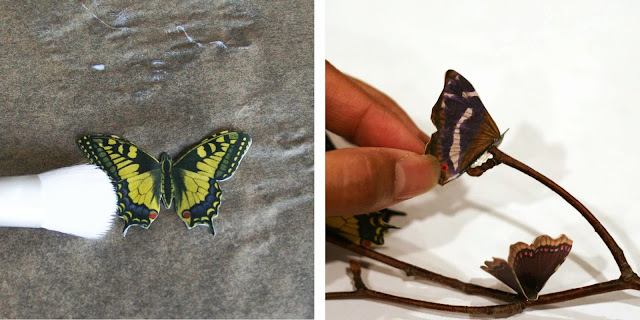 Make sure not to touch the edges of the butterfly paper as it is delicate when wet and may tear. Using a duplicate butterfly print, match up the butterfly and repeat on the reverse side of the glass. Find two identical butterfly shapes. 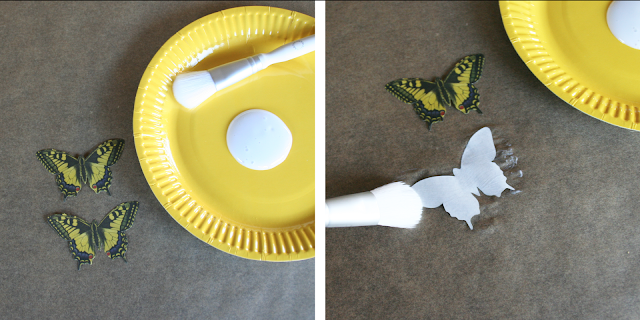 Apply a light coat of medium to the back of both butterflies, then press them together. Although they are identical, they may need a little trimming around the edges. Do so with a pair of small, sharp scissors. Apply a light coat of medium to both sides of the butterfly. Let dry completely. Fold your new 3-D butterfly at the wings and attach it to a branch with a strong adhesive. 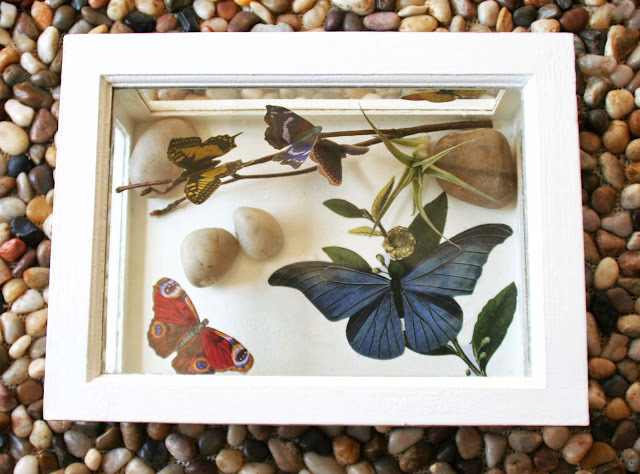 Place the butterfly branch in the box with a few stones and plants... And you're done! and from the top with the lid closed. 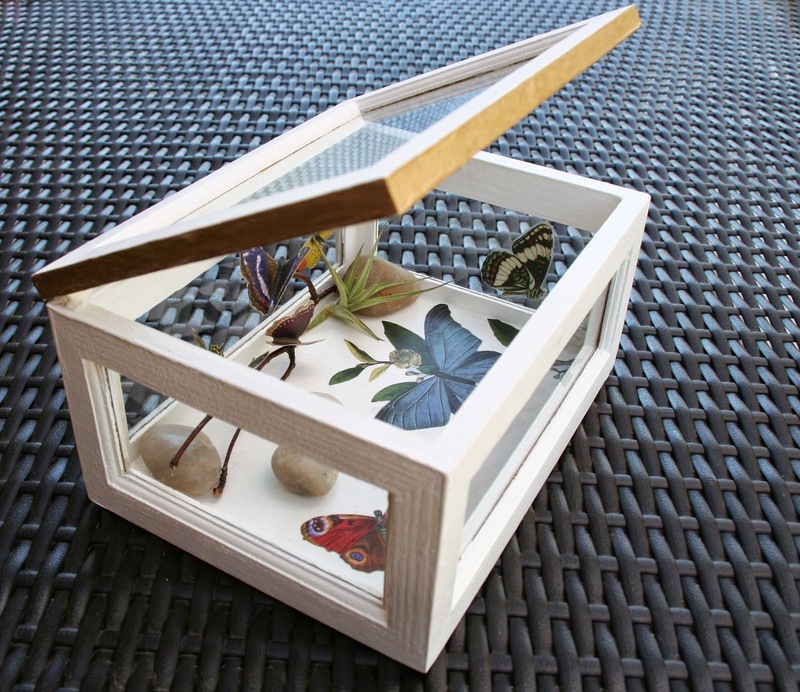 For now the box is filled with butterflies, but eventually I plan on using this as a terrarium to house a few mini plants. 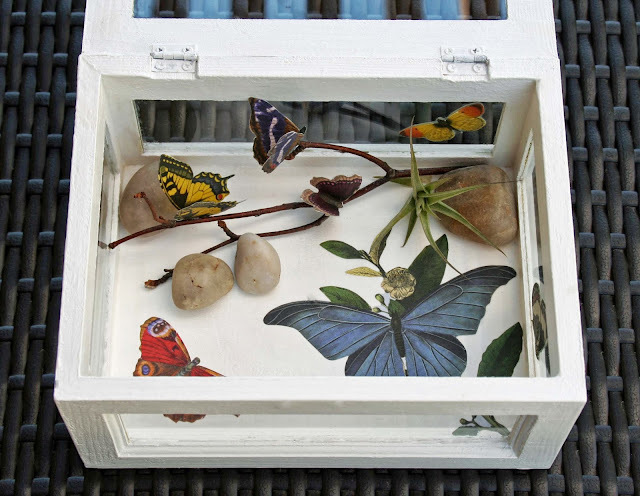 Since plants go hand-in-hand with water, the waterproof qualities of the decoupage medium will protect the inside of the box from condensation and moisture. disclosure: some of the products used in this post were from a previously sponsored campaign. As always, all opinions, photos and project ideas are my own. bliss bloom blog in a Magazine! Our Lives // First Day of School!